We finally experienced torrential down pour for the most part of the day on Sunday. I was really excited about this for these reasons: a) We're experiencing serious drought, and any sort of precipitation is welcome. b) I loooove driving in the rain. 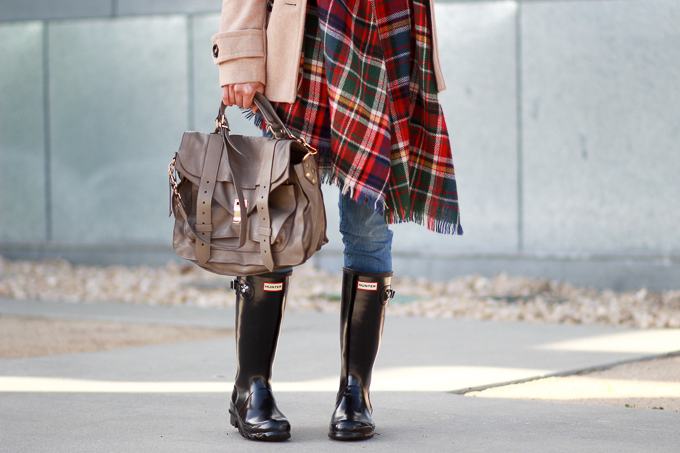 c) I get to wear my Hunter rain boots and step through puddles with no problem. For reference, I'm wearing the Hunter rain boots for big kids. I'm a size 6 in women's sizing, but I found that the big kids boots were a good fit for me. I also want to pick up their Original Tour Gloss boots (in women sizing) at some point since it's a more travel friendly pair because you can easily pack it in your suitcase. They're also available in 6 colors, and at this point, I don't know which color I can commit to yet. I'm eyeing on either one of the red pair. And maybe I should wait until El Niño is in full swing here in LA. I've only worn my Hunter boots a handful of times. Any chance I can wear them, I'll take it. I find it oddly satisfying knowing that my shoes are meant to get wet. I've also worn them previously during my trip to Mammoth Mountain (watch my vlog). Could you imagine the joy on my face when I walked down the streets while it was snowing... and my feet were warm and dry? Oh, the simple things. Or maybe it has something to do with my childhood. I lived in a tropical place where monsoons were a regular thing, yet I didn't own a pair of rain boots. And, I'm just realized this right now as I was typing this post. I lived in a country where it was wet for half a year, but no rain boots. Am I just now compensating for not having rain boots in my life (when I needed it the most) that I now own a pair, yet I'm living in the driest part of the country? Anyway, I've been enjoying every chance that I get to wear them. Thank you! Yes, they're definitely more inexpensive than the adult version. The perks of having small feet :). 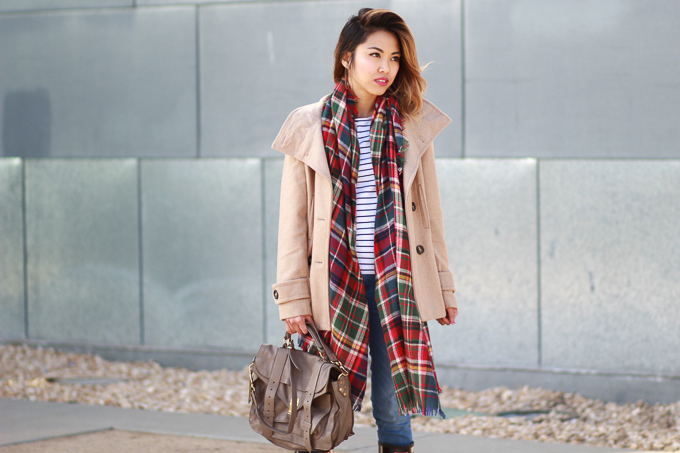 Love the plaid and stripe combo. Oh Anne I do like your outfit you look gorgeous wearing your shiny black Hunter Wellies, I've got a pair of shiny black Hunter Wellies and I've been wearing them going to work for the last few weeks they look really smart and they keep my Tights dry when it rains.